Every time I visit a classic car show I try to get some shots of the ‘mascots’ which were used to adorn the radiator cap. Most of the time when I review the final image I’m not happy. What I want to get is a shot which is sharp for the ornament, but without a distracting background. In a controlled setting you could control the background, but at an outdoor show it’s hard. I have seen photographers set up their tripod, set up the shot and then get behind the ornament with a black cloth to create a better background, but I’ve never been quite that ambitious. What I try to do instead is find an angle which finds a neutral background. Sometimes the car next door works well, sometimes it’s the trees. The really tricky part is getting the sharpness right. For this shot I used the Nikon 105mm macro and I’m quite pleased with how it came out. At f8, I was able to keep most of the foreground sharp, but get a nice blurry background. 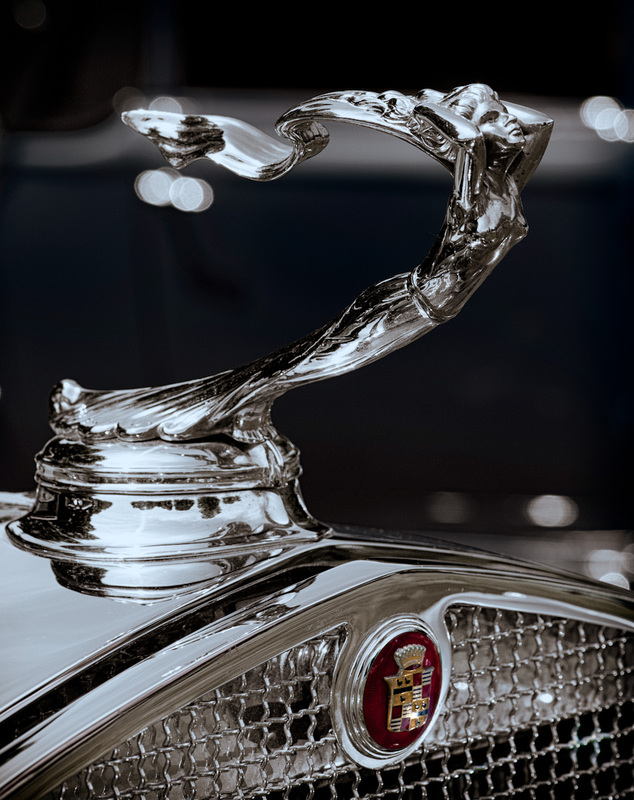 For you car fans out there, this ornament was on a 1930 Cadillac V-16 Fleetwood Cabriolet. The car was one of many fine automobiles on display at the 2011 Eyes on Design car show held at the Edsel and Eleanor Ford mansion in Grosse Pointe Shores, Michigan. This image was another one in which I liked the color version but also liked the black and white. The problem I had with the color is that I thought the blue car in the background somewhat distracted from the hood ornament. The problem with the black and white was that it somewhat diminished the beauty of the Cadillac medallion. So, I compromised. I converted the image to black and white but masked out the medallion. I also reduced the opacity of the black and white layer just a bit, so there is still a hint of color in the image. It may not show up in the photo, but the color in the background of the final image is a very dark blue. I did one other thing to the image as well. In the color version, I believe there is just a portion of a person’s arm in the upper left. For the finished version, I rescaled the image slightly to move it mostly out of the frame. That, combined with the conversion to black and white eliminated what I considered to be a distracting element in the color version. I would be happy if you would let me know what you think, good or bad. Thanks for looking in! Great work James! There is a world of difference between the original and the final! 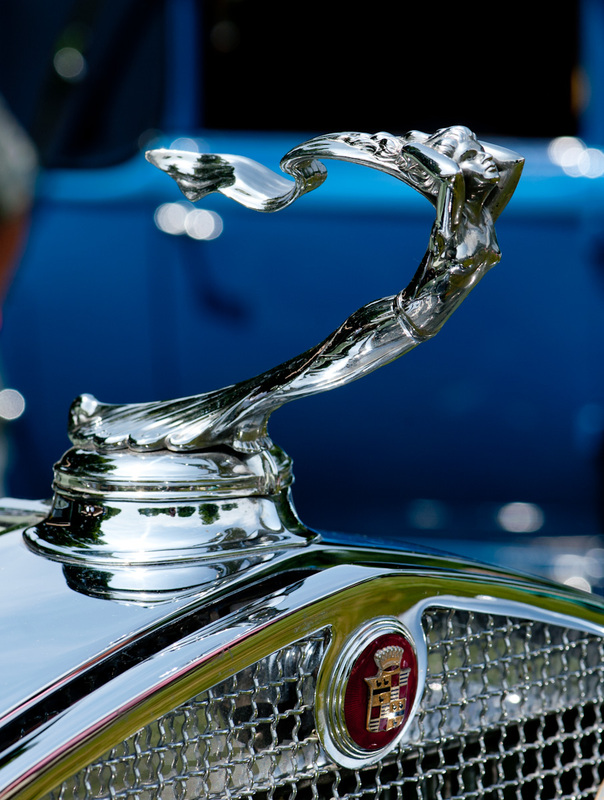 There certainly do not make hood ornaments like they used to. Great shot and I like how you kept the bit of color in there with the Caddy emblem. Nice work!